London, UK -- ACCORDING to Buddhist philosophy, meditation is the answer to many human ills. If our minds are calm and free from fear we will know true health and happiness, it is claimed. In the East millions of people seek enlightenment through meditation but for many of us the concept is all a bit too spiritual and hard to grasp. However there is growing evidence that a form of the technique, called mindfulness meditation, should be regarded as a potent treatment for patients who have suffered from depression. Studies show that those who have fallen into depression twice have a 70 per cent chance of relapsing, even if there has been successful treatment. Research has found that mindfulness meditation can cut those rates by 50 per cent. Results have been so impressive that Nice, the government body that approves NHS treatments, now recommends this form of meditation. There is concern that GPs are prescribing antidepressant drugs too freely. About 36 million prescriptions for drugs, including Prozac and Seroxat, are issued each year: that’s twice as many as in the Nineties. In future advocates say mindfulness meditation will become a viable alternative to antidepressants as a frontline treatment. Meditation is often linked to de-stressing and relaxation. Mindfulness therapy can be calming but it’s a specific form of treatment developed for treating mental health problems. It began in the US about 20 years ago but has now gained acceptance here in the UK. In simple terms patients are encouraged to let go of negative feelings by concentrating on something else. Usually it’s their own breathing but it can also be an object such as a stone, candle or flower. It’s often taught in group sessions but can be practised alone, at home or at work. Although its roots lie in Buddhism and Eastern philosophy, mindfulness meditation is not religious or spiritual but evidence-based. More than 100 studies have shown that brainwave activity changes during meditation and that areas of the brain linked to controlling emotion are bigger in people who have meditated regularly for five years. Mindfulness training has also been shown to increase activity in the pre-frontal cortex, a part of the brain associated with positive emotion that is often subdued in depressed people. One in 10 people in Britain is affected by clinical depression, defined by a range of symptoms within a single two-week period and 50 per cent of sufferers experience it more than once. Is mindfulness meditation an alternative to drugs? Evidence shows that it is best for patients who have been treated for depression and are at risk of suffering another bout. Meditation should be regarded as a treatment to work alongside drugs or other techniques such as exercise therapy. It shouldn’t yet be considered as an alternative to antidepressants, although future studies may show that it works in their place. Usually, patients are prescribed eight to 12 meditation sessions with a therapist. Is it any different from cognitive behavioural therapy (CBT)? but there are quite distinct differences. Whereas mindfulness meditation is all about letting go of negative emotions, CBT encourages patients to focus on a problem and rationalise it. Eventually, by using CBT, patients can change the way they think. One of the key differences between the new approach and that of traditional CBT is that patients are seen between episodes of depression rather than when they are in the grip of the condition. How do I get mindfulness therapy? In theory the first step is to visit your GP, who can refer you for free treatment on the NHS. Some doctors remain sceptical but the real barrier, according to the Mental Health Foundation, is that few healthcare trusts are offering it. Just one in five GPs says he or she has access to mindfulness meditation for depression and just one in 20 says he or she is regularly prescribing the treatment. What about other types of meditation? 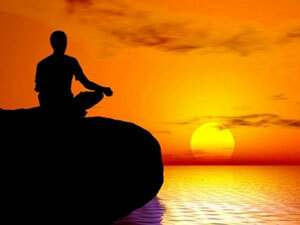 There are many methods of meditation including some which involve chanting mantras. The common theme is a raised state of calmness. Meditation does not have to involve keeping still: walking meditation is a popular Zen-style and repetitive movements using beads or prayer wheels are used in other faiths. Transcendental Meditation (TM), a relaxation technique developed in India and practised by The Beatles in the Sixties, is claimed to alleviate stress and tiredness. In chakra meditation patients are encouraged to focus on different areas of the spine. One of the biggest problems is measuring the health benefits of meditation, especially on the mind. Can meditation also help my physical health? There is evidence that different types of meditation can be effective painkillers. Researchers in the US also found that people who practised TM had significantly reduced levels of heart disease and strokes. Although a small study, there was also a reduction in blood pressure over a nine-year period. It is also claimed that meditation can combat asthma and inflammation. However a 2007 study sponsored by the US government concluded that the benefits of TM were no better than good health education.